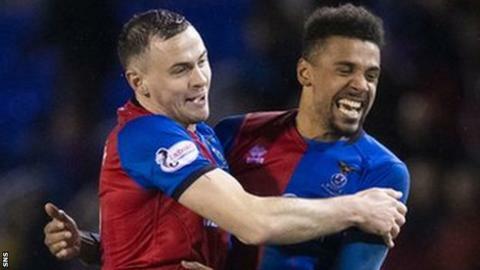 Inverness Caledonian Thistle lost a total of 30,000 from their crowds in the season after being relegated and have found attracting fans "a huge challenge", says chairman Graham Rae. The Highland club dropped out of the Scottish Premiership in 2017 and were fifth in the Championship last term. This year, they sit fourth but set up a Scottish Cup quarter-final with Dundee United after beating Ross County. "Getting people through the gate is a huge challenge," Rae told BBC Scotland. "Attendances have been falling for 15 years in a row - other than the year we won the Scottish Cup. Last year in the Championship versus our last year in the Premiership, 30,000 less people came." In the week that marks the 25th anniversary of the club's first ever board meeting after the merger of Inverness Caledonian and Inverness Thistle, Rae says attendances are one of many issues facing the club. Should they fail to gain promotion this year - they are currently 12 points off leaders County in the sole automatic spot - they would cease to receive parachute payments from the SPFL. The club are also poised to declare another financial loss for the year, but Rae says focus on youth development and engagement with the community remains a priority to take the club forward. "We've lost money in terms of profit and loss for probably three quarters of the 24 years, and we're about to declare another loss," Rae said. "Cash is king in football. We've recently had our stadium and stands back which has added a substantial sum to our balance sheet which makes us much stronger. "Coming in after relegation, we chose as a board of directors to retain our youth and community arms, which we believe are the future of the club."